American company Curtis jewelry manufacturing co., known since 1936, produced high quality jewelry. These were silver and gilded ornaments with semiprecious stones and ivory – brooches, clips, and necklaces. However, the history of Curtis is inextricably linked with another American company, Uncas Manufacturing Co., part of which it became in 1936. As for Uncas Manufacturing Co., its owner was Vincent Sorrentino (1892-1976), an Italian immigrant who came to America in the early 20th century. He first registered the Sorrento company in 1911 in Providence, Rhode Island. Of course, the earliest Sorrento jewelry is difficult to find now and they are a collectible rarity. Then, in the early 1920s, Vincent Sorrentino renamed Sorrento into Uncas Manufacturing Co. Uncas jewelry was popular for its variety, exquisite design and high quality. Along with the above-mentioned Curtis jewelry manufacturing co, the Curtman Company also joined the Uncas Manufacturing Co. In addition, Uncas Manufacturing Co. acquired the company Vargas MFG together with its building in 1996. Interestingly, the Sorrentino family still continues the jewelry business. Noteworthy, the letters DCE that appeared in 1950 refer to Curtis jewelry manufacturing co. 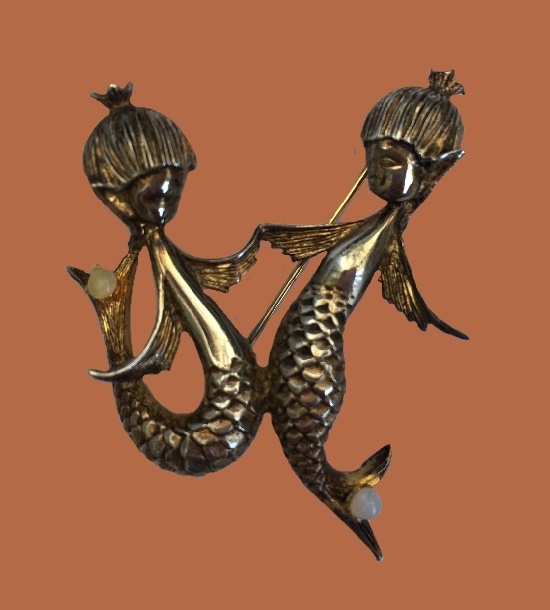 According to American jewelry designer, sculptor and artist Karen Rossi, she began her professional career in 1987 as a family welding business. 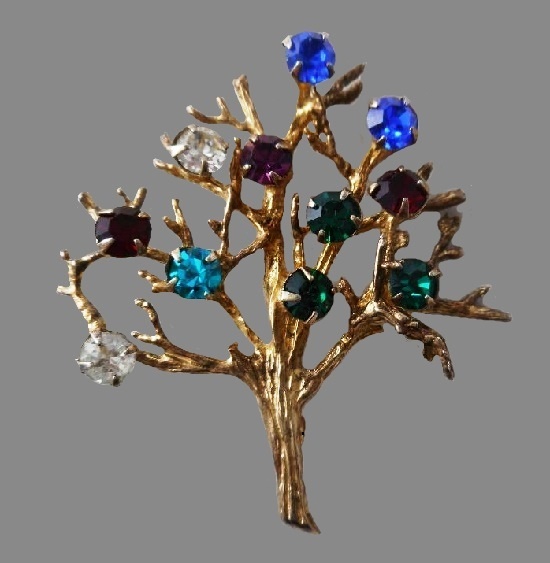 And for jewelry lovers, the designer became known for her very cute and funny pins. 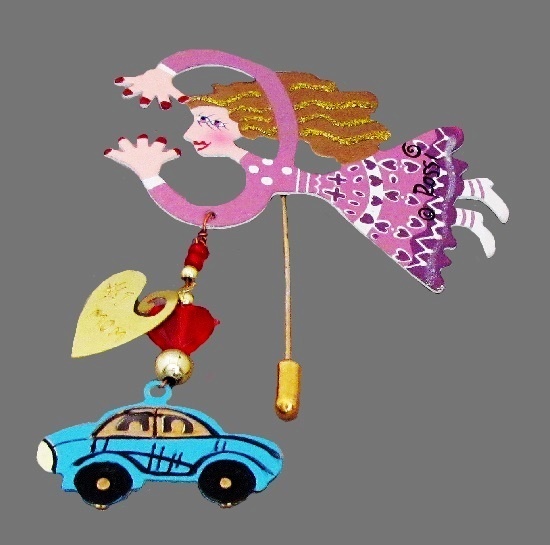 In particular, striking in their originality decorations depicting flying ladies. Besides, these flying figures personify various professions, and hobbies, from a shopaholic to a teacher. Traditionally, American designer Karen Rossi uses pewter (tin-based alloy), bright enamel, rhinestones and faux pearl. All decoratins have designer’s stamp. Of course, such unusual themed pin will be a perfect gift for your colleague, sister, grandmother, best friend, gardener, or a teacher. 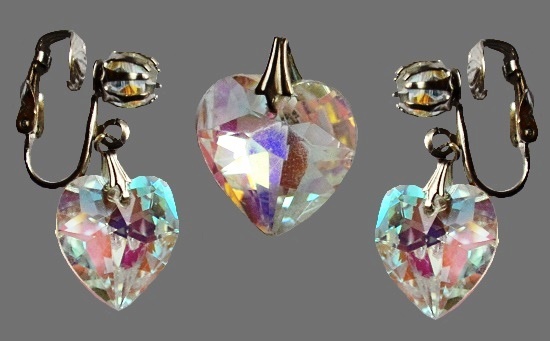 New York City based company Royal Craftsmen Inc. founded Laguna jewelry brand in 1944. The highlight of Laguna, which distinguishes it from any other brand, is jewelry made of high quality artificial pearls. Large pearls framed in gold-colored alloys give the impression of real jewels. And the multi-colored necklace beads, which Laguna was also famous for, were not inferior to jewelry in terms of the quality of design and execution. In addition to artificial pearls, Laguna traditionally used Austrian crystals and faceted beads. Laguna ceased to exist in 1980, so any product labeled Laguna is definitely vintage, and often – a rarity. Founded in Copenhagen in 1953 by Orla Eggert and his wife Grethe Eggert, Flora Danica is the most unique Danish jewelery company. The uniqueness of this jewelry is in particular, in the casting technique, real botanical materials used as the base. As a result, each piece is truly realistic, one-of-a-kind botanical jewelry of the highest quality. Indeed, all jewelry is unique and no two can ever be the same. 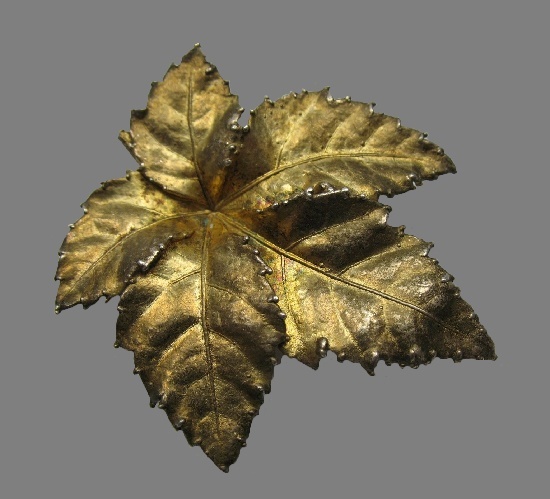 A living flower or a leaf taken as a basis, then coated with silver or another 24-carat gold by electroplating. Even the destroyed base leaves an exact silver or gold copy of a living plant. 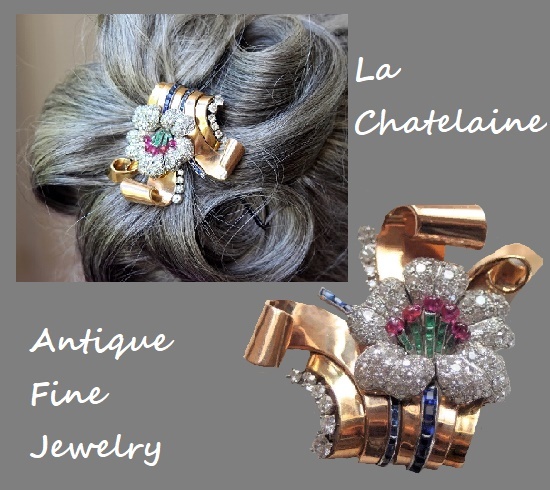 Noteworthy, gorgeous vintage jewelry line is among the most collectible of botanical style European jewelry. The history of the French brand “Les Nereides” began with the love story of Pascal and Enzo Amaddeo. She, from a hereditary family of artists (her grandfather was a friend of the famous Belgian artist Rene Magritte). He, from a family of non-conformist Italians. Young people met in Belgium at the Academy of Fine Arts and fell in love at first sight. A wedding took place very soon, and on April 14, 1980, the world saw their first joint creation – a jewelry boutique in Nice. Their union is a combination of two worlds with common interests, a love for photography, life and a great desire to fulfill their dreams. By the way, the name “Les Nereides” means “sea nymphs”. Meanwhile, visiting their website I’ve stumbled upon a quote about jewelry by outstanding Russian artist Wassily Kandinsky. “The jewels are like music, there are so many notes, you have to play with them and create your own melody to put the strings of the soul in motion”. Located in New York City, Park Importing Company began producing costume jewelry under the “Vogue” label in 1936. The company owners, founders and the main designers were Harold Shapiro and his partners Jack Gilbert and George Grant. Originally, the company specialized in manufacturing faux pearl jewelry and beads. Traditionally, Vogue costume jewelry demonstrated originality, innovation of design and very high quality. This explains the popularity and demand for Vogue decorations among costume jewelry lovers. Having worked as the main designer of Vogue jewelry, Harold Shapiro left the company. And already in 1963, he and his son Bernard founded Les Bernard, Inc.
Noteworthy, the earliest pieces have marks “VOGUE JLRY”, or “VOGUE” and they are scarce on the market. Vogue company ceased operations in 1973.